On the Zionist political spectrum, Jewdar is a pretty solid two-stater who believes that when it comes to the sorry state of Israeli-Palestinian relations, there’s plenty enough blame to go around. Furthermore, Jewdar is not at all a fan of the school of thought that thinks that the only way for Israel to be a fact is for the Palestinians to be a fiction. That said, we do love the Jewish State, and are in love with the Jewish People (though there are times when it seems like we’re on the bad side of an abusive relationship), so when we encounter the same kind of dishonesty and bigotry directed at us and ours, well, it’s time for Jewdar to release the Kraken. And after Palestinian academic Nur Masalha’s new exercise in historical denial and borderline antisemitism, Palestine: A Four Thousand Year History, suffice it to say, the Kraken has been released. Now, let us note that this was a yontiff read, so we weren’t taking notes, but there was enough to enrage us that we began to morph into Tyrantosaurus Rex almost immediately. Demonstrate that in fact, “Palestine” is a term of such antiquity and ubiquity that it should be accepted as the legitimate term for the area that is currently Israel and the West Bank/Gaza. Demonstrate that no other term for the land can stake such claims. To suggest that today’s Palestinians are, in fact the rightful heirs of that antiquity, and that thus, they are the rightful occupants of the land. To suggest that today’s Israelis have no such claim, and thus, have no right to be there. Had he kept it at 1 and a half of the explicit goals, we might have found it a useful read. Instead, he makes the kinds of extremist arguments that can only be supported by the same types of methodologies used by other deniers of history (including those who deny Palestinian history). Ignore statements or facts that challenge your position. Willfully twist the meaning of things. What ensues is a text which is at best, simply sloppy and overly simplistic; at worst, it’s a work that reads Jews out of the narrative of the land’s history, and indeed, rejects the notion of Jewish peoplehood. If a Zionist writer said it about the Palestinians, Jewdar would say it’s anti-Palestinian. If a Palestinian says it about the Jews, we’re comfortable calling it antisemitism. Moreover, in order to accomplish this, Masalha resorts to a remarkable feat of unselfconscious hypocrisy. Given all that, we are not inclined to be generous. So let’s see what’s so problematic about Masalha’s work. This will not be exhaustive. Pgs. 23-25 He argues that Maimonides’ ideas of “the strict oneness and Unity of God” came from the Quran, as opposed to the Jewish traditions that predate the Quran. Part of his argument seems to be that biblical texts are at times a bit squishy as to whether or not there is one God (monotheism) or one God all powerful among many (monolatrism), but he seems to be unaware that there is well over a millennium of Jewish thought between the appearances of those texts and the appearance of Maimonides (and quite a bit of time between those texts and the appearance of Muhammed.) Similarly, he ascribes to Maimonides a notion of the Jews as a “community of faith” as opposed to a people. This is an outrageous anachronism—quick question: What’s the word in the Torah for “Judaism.” Answer: There isn’t one. The Mitzvot, as understood by pretty much everybody, were simply the obligations that the Jewish people took upon themselves when they accepted the Torah. And what is Masalha’s citation for these claims? There isn’t one. The implication, of course, being that Jews were not yet a distinctive people. This, of course is odd, because we know that there was a Temple in Jerusalem at the time, and we know that Jews in Palestine and the Near East kept various commandments associated with Jewish monotheism as evidenced by the Elephantine Papyri. Jewdar can’t think of any mainstream historian who would argue that by the 5th century (during the Persian Empire) monotheism was not being practiced in Eretz Yisroel. His citation? An earlier work of his own, with no page number. Pg 96: He declares that the Eastern Roman Empire came to be known as the Byzantine Empire after 476 AD; actually, they considered themselves to be the Romans; the term “Byzantine Empire” was coined in the 16th century. As will be seen later, this is not a minor quibble, and it’s particularly ironic for someone who pretends to place a high premium on eliminating anachronisms. He claims that “Eretz Yisrael” is a modern construct. In fact, it appears first in Neviim, and later on in the Talmud and other Jewish sources (those are all extremely pre-modern). And, in fact, if he actually knew a thing or two about Maimonides, he would know that Rambam refers not only to Eretz Yisrael, but to the importance and holiness of it. Pg 56—he writes that “new archeological discoveries from a 3000 year old Philistine graveyard in Ascalon” have rewritten “the paradigm” on the Philistines, “firmly suggesting” that they were not Aegean marauders but “an indigenous population of the Near East.” The problem? The source he cites—an article in Haaretz—actually states just the opposite. While part of the article is about how a particular archeologist has reinterpreted some Egyptian depictions of the Philistines to suggest that they weren’t Aegean, the graveyard material is in the other section of the article, about how the Aegean theory still has support, in part because of the clearly Aegean-style burials in the cemetery. Pg 385—refers to Ashkenazi Jews as “European converts to Judaism.” No source, nor explanation of when ese conversions took place, is given. Aside from just out-and-out errors, there is also the larger, meta-argument—the unique legitimacy of “Palestine” as a toponym. The problem with that (other than the notion of “legitimacy” in the context of the whole conflict) is that his main sources are exactly the kind of “colonial-settler,” “Eurocentric” sources he criticizes through much of the book. Thus, while he condemns what he considers “colonialist” terms like Rhodesia, the Falklands (the Spanish-colonialist term “Islas Malvinas” being more “indigenous” in his view) and Constantinople (which is somehow less “indigenous” than Istanbul, but which was imposed by the colonial-settler Ottomans later on), when it comes to the legitimacy of “Palestine,” he resorts almost entirely on sources from outside the land. Masalha cites Egyptian and Assyrian military sources, Herodotus and a variety of Hellenistic and Roman writers to show that all referred to this area as some variation of “Palestine.” Leaving aside legitimate questions about what precisely was meant in each usage (i.e., in some cases the coastal areas, in some case, further inland, in some cases contemporary, in some cases historical) there’s the larger issue that it is pretty ironic for Masalha to privilege the names applied to the area by outsiders—exactly what he spends much of the book condemning when it’s done in the modern period. I.e., a whole chapter is devoted to attacking Zionist Hebraization of Palestine, but seems to consider Hadrian’s replacing Judean Jerusalem with Palestinian Aelia Capitolina to be perfectly natural. So Herodotus called this “Palestine.” So what? Did he live there? Was that based on speaking to the people who lived there? Were there other terms in use? This is not just hypothetical musing on Jewdar’s part—the fact is that the only way Masalha can make the argument that “Palestine” was the “legitimate” name for this area is by ignoring the fact that there were other names in use at the time, by the people who actually lived there, names that enjoyed considerable antiquity. But here’s the thing—the terms used by Herodotus weren’t “indigenous” (to use a term Masalha likes) names; in fact, in the same passage cited by Masalha, Herodotus refers to Phoenicia, a term applied by the Greeks to peoples who called themselves some variant of “Canaanite,” a term Masalha rejects as being both imprecise and having fallen into disuse long before the period under discussion. So at least some of the people living in the land under discussion called it some variant of “Yehuda.” The Neo-Babylonian and Persian empires did the same. So why should we privilege Herodotus’ use of “Palestine” over the terms used by indigenous Near Easterners? As for the argument that Herodotus was followed by other Greeks and Romans, so what? That’s like saying that because Columbus called the people he found “Indians” and so did everybody who followed, the names used indigenous peoples of the Americas lack legitimacy. He uses “Aelia Capitolina” even before it existed; on page 108, while engaged in a remarkable feat of linguistic acrobatics to avoid making any mention that Herod was a Jewish king who ruled over a Judea whose religious center was Jerusalem, he refers to the “Greek-speaking Idumite” Herod who developed “Aelia Capitolina” as the religious capital of his “autonomous kingdom” in “Palestine.” This, of course, being over a century before Jerusalem was renamed. On page 86 he declares that after the city was renamed, “the name ‘Jerusalem’ almost became extinct.” Of course, there is no citation for this, because it’s not true. Not only did Jews continue to use, but even Christian sources that he cites referred to it as “Jerusalem.” Thus, on page 109, he makes reference to the Council of Chalcedon’s supposed “Decree on the Jurisdiction of Aelia Capitolina and Antioch,”but the actual quote he cites from the decree makes no reference to Aelia Capitolina, but to Jerusalem (though Masalha then puts “Aelia Capitolina’ in brackets.) This shouldn’t be surprising, since the actual Decree issued by the Council seems in fact to have been “Decree on the Jurisdiction of Jerusalem and Antioch,” and Masalha seems to have taken it on himself to unilaterally (and one might argue, disingenuously) rename it. Similarly, other figures he cites, like Procopius, continue to make use of “Jerusalem.” Indeed, far from becoming ‘almost extinct,” the name “Jerusalem” was given an entirely new lease on life by the adoption of Christianity, whatever the official name might have been. 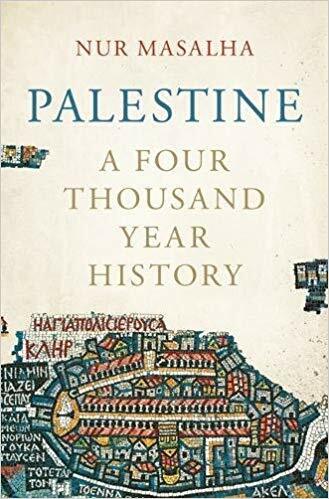 There are a few other odds and ends—he actually offers very few pre-modern indigenous references to “Palestine,” and even some of the arguments he makes to suggest the conceptualizing of Palestine are a bit forced. In one chapter, entitled “Palestinian Statehood in the 18th Century,” what you think is going to be a lead-up to a state calling itself “Palestine,” is actually about the establishment of a small state in the north which made no reference to Palestine. While he argues that this was sort of a foreshadowing of Palestinian nationalism, it’s just as reasonable to argue the opposite—its northern orientation and connections to areas in what are today Syria and Lebanon highlight the degree to which northern “Palestine” was at least as well linked to those regions as to “Palestinian” areas further south. .He considers the lack of opposition of local elites to the creation of a more autonomous province of Jerusalem in the 19th century a sign that they had a separate Palestinian identity, as opposed to reasonable alternative that they were simply happy to have more local control. And when he speaks of the British Mandate, he presents it as being the merging of the three “Palestinian” Ottoman provinces, as if it ultimately recognized a pre-existing polity. Leaving aside that there were questions as to what constituted “Palestine” even among those who used the term, the Mandate actually was composed not only of those three provinces, but bits and pieces of three others (Ma’an, Damascus and Beirut), so that any number of the “Palestinians” in the Mandate, even by the inclusion of all the provinces of Acre and Nablus and not just Jerusalem, had not been “Palestinian” before. And that’s one of the things that’s problematic about this kind of meta-approach, as if the moment that the Egyptians made a reference to the land of the Peleset, the modern Palestinians became a glimmer in some deity’s eye. It’s like playing a game of Rise of Nations or Age of Empire. The fact is that a few decisions in another direction—if Faisal’s Syrian kingdom had been successful, if there had been no Zionist movement, if the British had called their Mandate something else—it’s unlikely that anybody would be writing anything about Palestinian people today. That doesn’t mean there isn’t one, only that its formation is a bit more complex and convoluted than the fairly quaint inevitable heroic narrative provided by Masalha. Which brings us to our final point—it actually doesn’t matter what the land was called by whom when. It doesn’t matter who lived there thousands of years ago. It doesn’t even matter who lived there 70 years ago. Palestinians in the West Bank are human beings and are entitled to the same rights as other human beings—a say in how their lives are run, whether in a Palestinian state or as citizens of Israel. Israelis are human beings, and are entitled to the same rights as other human beings—a say in how their lives are run, whether in the current iteration of the bi-national Jewish state, or some future version of a binational, less-Jewish state. Works like Masalha’s are irrelevant except to the extent that they reinforce the certainty of one side or another that their narrative is the only correct one, and should be judged by the extent that they need to engage in deceit to delegitimize the other side. By that standard, run, don’t walk away from this book. On the other hand, if you’re looking for an excellent and extremely balanced work on the Israeli-Palestinian conflict, check out Hillel Cohen’s Year Zero of the Israeli-Palestinian Conflict. It won’t take you back four thousand years, but what it lacks in quantity it more than makes up for in quality.